Northborough, Mass. 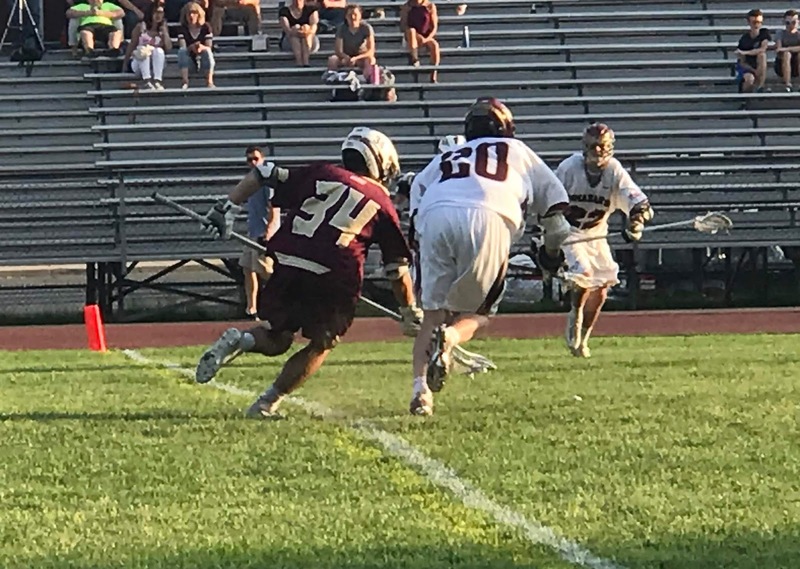 - It was a back-and-forth battle between the Algonquin Tomahawks and the Concord-Carlisle Patriots on Friday evening, and the two teams needed more than four quarters to settle on a winner. But, less than 30 seconds into overtime, Jack Bowen netted the game-winner to lift the visiting Patriots past the Tomahawks 11-10. Concord-Carlisle started the game hot, with Alexi Hunt scoring first, followed by two goals from Matt Moreau. 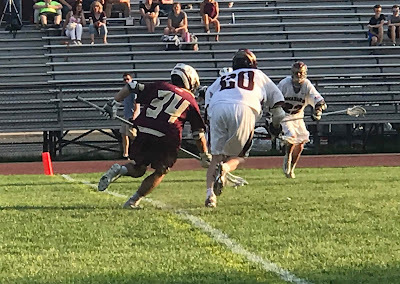 Then it was Algonquin who countered with two goals of their own, one from Noah Larsen on the man-up, and another from Dom Russo. However, Robert Doherty scored for the Patriots with under a minute to go. Ben Kacher stood on his head between the pipes for the Patriots, making 5 of his 9 saves in the first quarter. After a quarter, Concord-Carlisle led 4-2. The second quarter started with a combination of solid defense and unforced turnovers from both teams. The Tomahawks got within one after Cal Willwerth put one in. But Concord-Carlisle scored the next three goals in just over a minute, as Devin Smith scored two and Jack Bowen added another to take a four goal lead. It seemed like the Patriots would have a solid lead going into half, but Nick Larsen scored with 12 seconds to go for the T-Hawks, and then Sean Collen put one in as the clock expired. At half, Concord-Carlisle had a 7-5 lead. Less than a minute into the second half, Alexi Hunt scored his second of the game to give the Patriots an 8-5 lead. But Algonquin scored the next three goals of the game, as both Dom Russo and Cal Willwerth scored their second of the game. To add to that, defenseman Burke Dion went coast-to-coast, and long pole ripped one in the corner to tie the game. Going into the final quarter of regulation, the game was knotted at 8. The fourth quarter was a back-and-forth affair, as Nick Larsen scored his second of the game, which was countered by Concord-Carlisle’s Matt Moreau’s third of the game. Algonquin’s Dom Russo scored his third, but it was Moreau again for the Patriots who tied the game just 30 seconds later. Both teams had a possession in the last two minutes of the game, but neither team could capitalize. Dom Russo had a good look in the final seconds, but his shot was stuffed by Ben Kacher. After 48 minutes, the game was tied at 10 goals a piece. It only took 23 seconds of overtime for Jack Bowen to net the game-winner. Both teams have playoffs on the horizon, and Coach Nofsinger is looking forward to his teams play in the tournament. Algonquin falls to 11-5, and will look to finish the season strong against Nashoba and Groton-Dunstable. Concord-Carlisle improves to 11-3, and has to play their final four games in five days, with tough matchups against teams such as Wellesley and Wayland.